LOCATED IN THE HISTORIC DISTRICT OF MENDOCINO, unlike many so called 'Mendocino' listings that are miles from town. The Tower offers well-appointed accommodations for 1 or 2 couples or a small group with pretty garden and ocean views. Stretch your travel budget by preparing some of your meals in the cheerful kitchen or walk to one of the fine local restaurants. The fenced garden creates a peaceful environment and accommodates bikes, kayaks, supervised pets and children. Smoke-Free environment. Check our website (below) for additional photos. At this writing, the nearby Botanical garden is alive with birds and pollinators. Book now for a fall getaway, Festival of Lights starting Thanksgiving weekend, and for whale watching later in the winter. 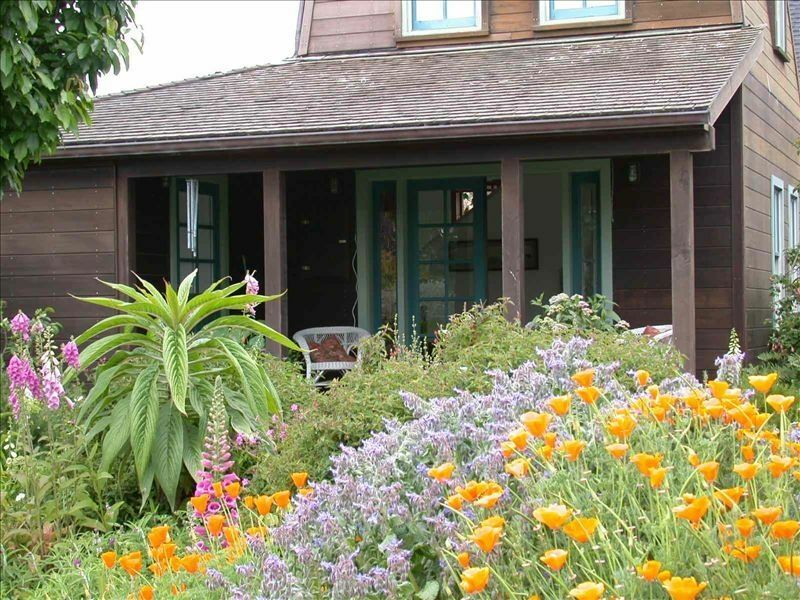 Innkeepers Don and Wendy Roberts purchased the historic Bever House in 1989 and re-built the adjacent water tower two years later as a unique guest house in the heart of Mendocino's National Historic District. Recently retired from Stanford University's Communiction Department, Don continues his writing and consults on children's television program. Wendy applies her non-profit management skills to various local endeavors, coordinates the County's Master Gardener Program and serves on the Advisory Board for County tourism promotion. Living near the ocean has always been a priority for us and the Village of Mendocino won our hearts because of the spectacular bluff top setting and the rural community with its strong focus on the arts and on preservation of the town and its natural environment. It's a privilege to live here and welcome others to this very special place. Staying in the heart of Mendocino Village allows our guests to enjoy its scenic beauty and share the slower pace and peaceful spirit of our rural community. Comfortable shoes are welcome wherever one goes...from one of the excellent restaurants, to a whale watching cruise, a hike up Big River, a Music Festival concert, Film Festival screening, Writer's Conference seminar...or just prop them up on our tree stump 'footrest' and lounge on the Tower porch with a good book. Tiled shower, sink and toilet on first level. A second door for access from porch. Little River Inn offers spa and golf services. Horse stables are a short drive north. Mendocino is a tiny historic town in a rural area of California's north coast. Ocean and Mendocino Bay are visible from upper levels. It's a short walk with ocean views to bluff top trails. Small, well-equipped kitchen and dining area with stove, full size frig, microwave, drip coffee pot, etc. Limited adult selections, more for children. Fenced Mendocino cottage garden surrounds Tower. Porch surrounded by colorful, fenced garden. The Tower is located in the Mendocino National Historic District, a short walk from restaurants, beaches, shopping, spas, galleries, and local wine, film, mushroom, whale, and film festivals. Little River Airport and golf course are less than 5 miles.